Full Description: Two examples from the Series of “Vitak-Elsnic Co. 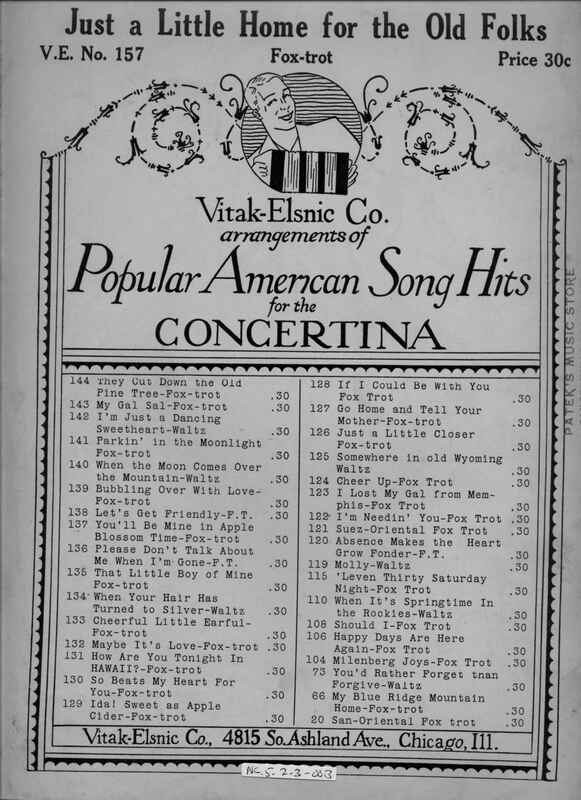 Arrangements of Popular American Song Hits for the Concertina.” Published from 4815 So Ashland Ave, Chicago, Ill. The mid-west states of Illinois, Wisconsin and Minnesota were, in the late 19th and early 20th century, the centre of the popularity of the Chemnitzer-style of concertina, a large square diatonic instrument that originated in eastern Europe as the Bandoneon, and became the instrument of choice amongst immigrants to the region for social dance and for song accompaniment. There were many hundreds of such pieces published by Silberhorn, by Patek and his Chicago music store, and by the Vitak-Elsnic company. This selection of popular songs and dance titles was sold via the Patek store (whose stamp is on the front cover), which offered music, instruments and records for eastern European emigrant communities. See also Items NC.5.2.3-002 [http://www.concertinamuseum.com/NC50203-002.htm] (Patek’s concertina arrangements) and NC.5.2.3-001 [http://www.concertinamuseum.com/NC50203-001.htm] (Henry Silberhorn concertina dance and song arrangements).